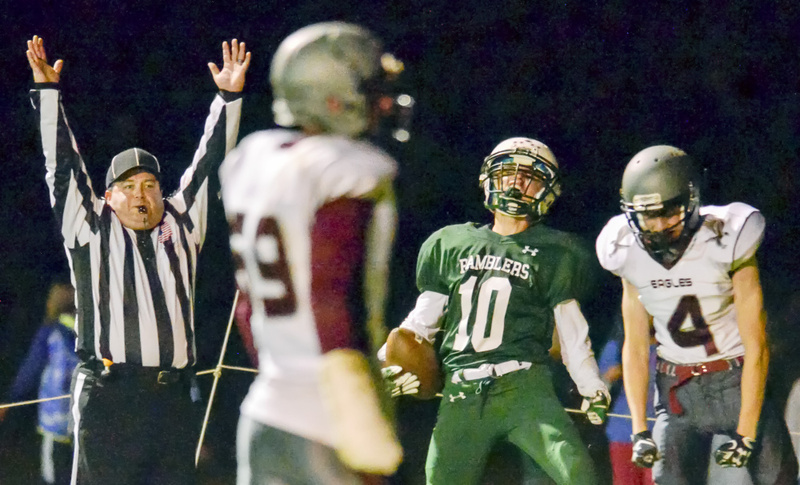 Cameron Gaghan helps Ramblers to big turnaround in win. WINTHROP — Cameron Gaghan changed his fortune in the span of a half. Giving up a fumble in the first quarter that led to an Ellsworth score, the Winthrop/Monmouth halfback could have easily taken himself out of the game mentally at that point. 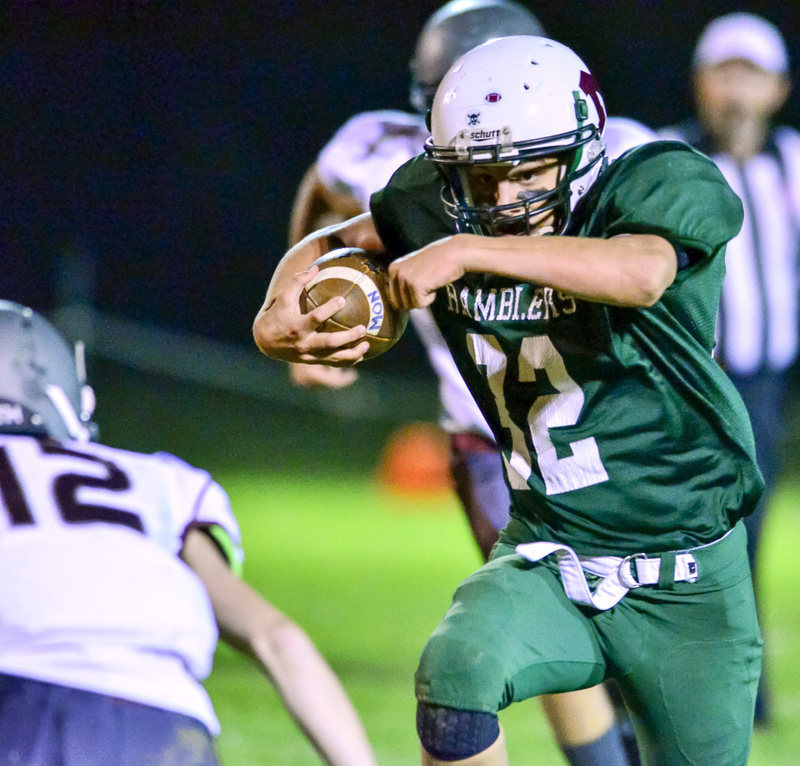 Instead, he scored the touchdown that helped lengthen the Ramblers lead, and a game-saving tackle that helped seal a 25-14 win Friday night at Maxwell Field. Winthrop/Monmouth (2-3) had some momentum on its second drive. 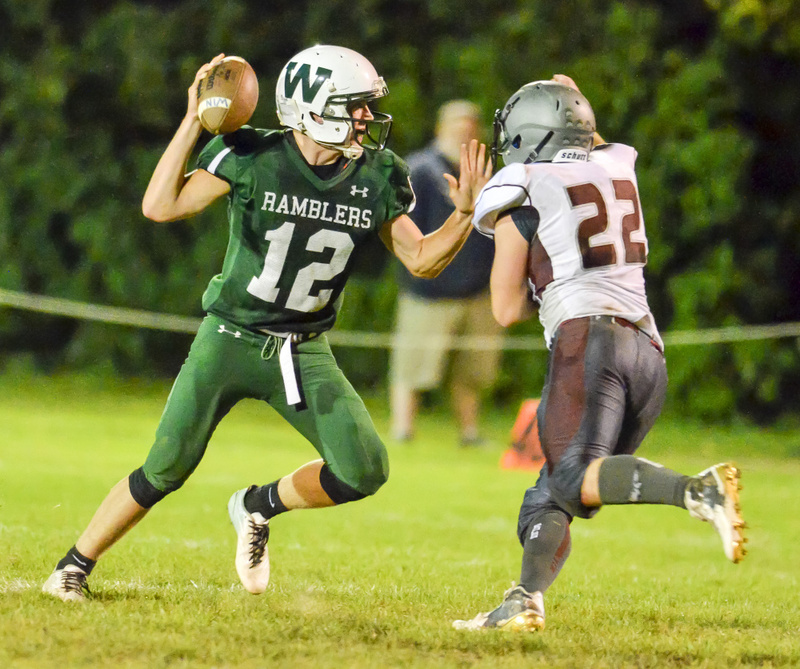 Ramblers quarterback Keegan Choate found Gaghan on a screen pass, but as he was nearly on the ground, the ball popped loose, and Ellsworth recovered. 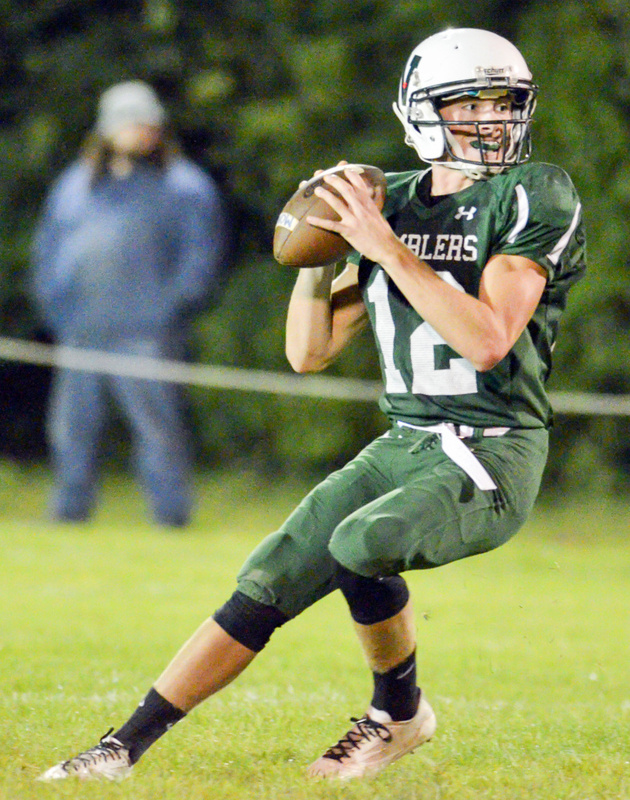 The Eagles (1-4) struck first moments later, as quarterback Connor Crawford found open space and dashed for a 67-yard score for a 6-0 lead. Winthrop answered back in the second quarter. 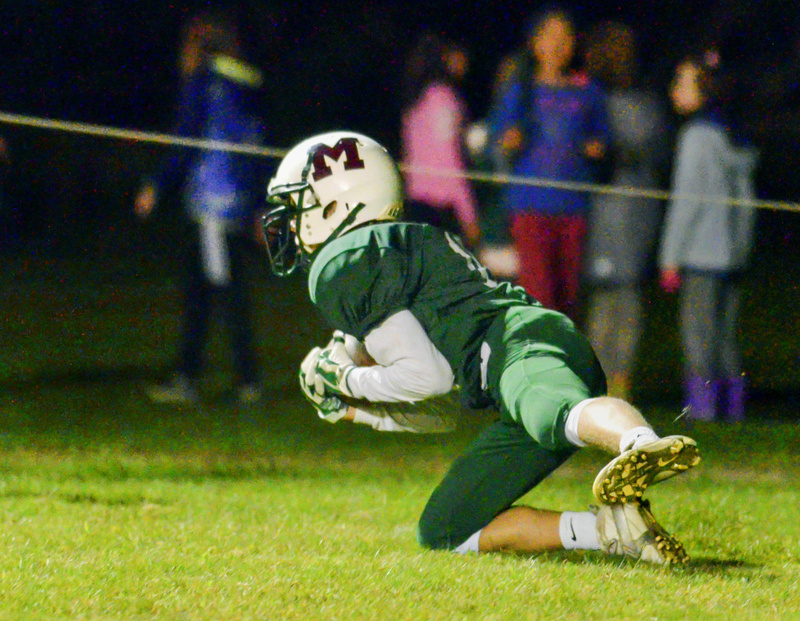 After a 29-yard pass from Choate to Evan Burnell to set the Ramblers up in the red zone, Choate found Dylan Lajoie on an out pattern in the end zone. Ryan Baird’s extra point gave Winthrop a 7-6 lead, which it held into halftime. Ellsworth struck again right at the start of the second half, as Crawford took the opening kickoff back 77 yards for a touchdown. Crawford connected on a pass on the two-point conversion for a 14-7 lead. The Winthrop defense set up the Ramblers third score, holding Ellsworth to a fourth down inside its own 5 yard line. A botched punt traveled 23 yards, giving Winthrop excellent field position. Four plays later, Choate found Lajoie for another touchdown pass — this time from 6 yards out — to give the Ramblers a 14-13 lead. Gaghan got his revenge on the following drive. Choate found him in the flat, and Gaghan was able to turn upfield and sprint for a 43-yard touchdown reception, lengthening the lead to 19-14. The Ramblers tallied their final score in the fourth quarter thanks to a 28-yard run by Ian Steele for the 25-14 lead. Ellsworth almost scored again after Steele’s touchdown when Crawford again found open field, and seemed destined for a score. But Gaghan caught him from behind, and the Rambler defense eventually forced a turnover on downs to seal the game. Gaghan led all Winthrop receivers with three receptions for 72 yards. Choate was 12 of 26 passing for 191 yards and three touchdowns. He also ran for 56 yards. Crawford led Ellsworth with 174 yards rushing on 24 carries.